Fill in your complete address in the appropriate fields, select your answer and send your data with the participation button. 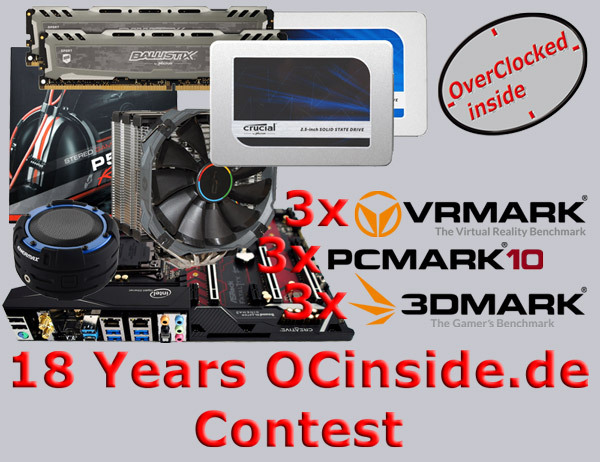 If you only want to participate on Facebook, YouTube and Twitter, or if you want to increase your chances of winning, you can additionally participate on the OCinside Facebook page, on the OCinside Twitter page and the OCinside YouTube Channel by also congratulating there until January 3, 2018 and writing how long you know OCinside.de. Your address will only be used for the competition so that the prize can be sent to you. The prizes are non-refundable and cannot be transferred to third parties. In order to keep the odds the same for everyone, everyone is only allowed to participate in the forum once and only once on Facebook, once on Twitter and once on YouTube. All products are shipped under exclusion of any warranty claims. The terms and conditions are accepted by participating in the contest. The lucky winner will be randomly determined after the 3rd January 2018 from all attendees (bribery is absolutely useless ). Afterwards, the winner will be notified by mail as soon as possible, so please pay attention to a correct email address when registering. ASRock, Arctic, Crucial, Cryorig, Enermax, Futuremark and Scythe ! The contest has ended and the winners are drawn ASAP.